Are you combating symptoms from this allergy season?? Try this warm hearty soup to help relieve your sinus congestion. 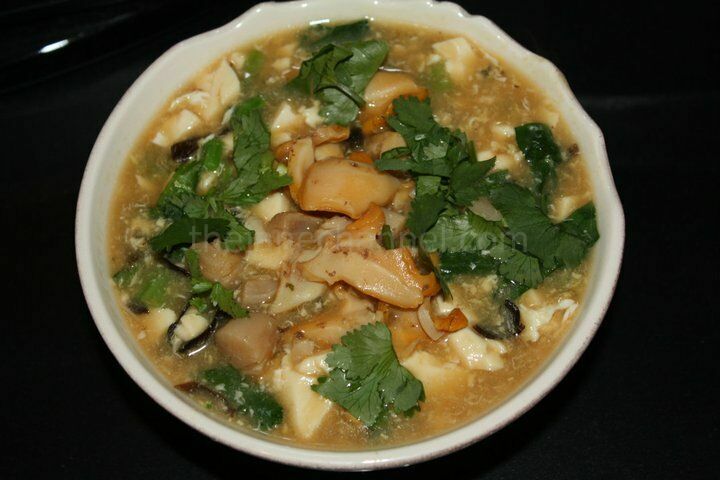 A main dish soup with nutritious ingredients including protein, and is low in fat. Pair with rice or even just having a couple of bowls of this soup will leave you satisfied. Soak the scallops in about a cup of warm water for 20 minutes, or until they soften. Drain and reserve the water. Soak wood ear in hot water and let it sit for 20 minutes. Clean and remove any hard parts with scissors. Cut into strips. In a skillet/pan, heat oil over high heat. Add ginger and stir fry until fragrant. Add the sliced conch and stir fry for couple minutes. Bring 8 cups of water to boil. Add ginger, conch and dried scallop. When it comes to boil again, lower the heat and simmer for 1.5 hours. Bring the soup to boil over high heat. Add wood ear. When it comes to boil again, lower the heat and simmer for 30 minutes. Bring the soup to boil over high heat. Stir in tofu and break them into pieces. Mix corn starch with 2 tablespoons of water. Pour into the soup and stir. Bring to boil and cook for 1-2 minutes until the soup becomes thicken. Then turn off the heat, crack an egg and stir quickly. Sprinkle with chopped cilantro to serve.